While I was getting my hair done this morning, I got a phone call from Dustin. I went ahead and answered it because he was at work and it could have been an emergency (although I felt horrible because it's rude to talk on your phone while sitting in the chair). He said he talked with our builder and I had to go pick out our front door. Panic set it! My hair stylist is in the middle of building her first home too, so we spent the majority of my appointment talking brick colors and everything that has to be picked out. I told her that I probably needed to get on it when it came to picking stuff out, but that I just hadn't. And then I got that phone call. So I went to go pick out our front door--I'll do a post on that later after it gets installed!! My biggest decision was double front door or single front door with sidelights--ahhh, decisions!!! Okay, so this post isn't about our new house. It's about our current place where we live. I took some pictures of our apartment during the big snow storm because I wanted to document where we spent our first year as husband and wife (and I had plenty of time ha). I know I'll love looking back on this and remembering all the fun we had in that little apartment! Looking in from our front door. Our first big purchase together. We bought this before we got married and had it shipped to an empty apartment that no one lived in :) I loved picking out the fabrics! This was taken from the stairs. An antique dresser that we use as our TV stand. This was given to us by our school nurse from when we were in high school. She is wonderful. 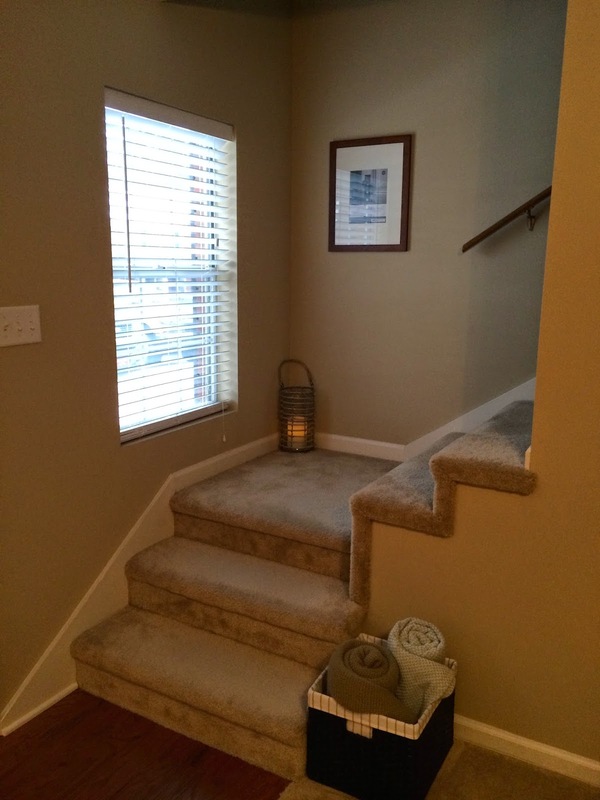 The door right behind it leads to a half bath. Double doors hides the washer and dryer. Our first Craigslist purchase! 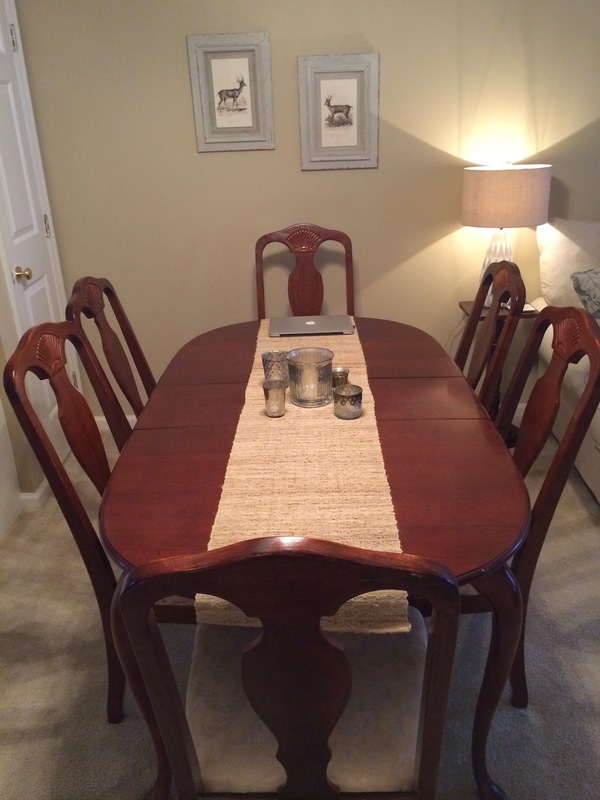 Funny story behind that, but we got a deal on this table and chairs. Also, the pictures on the wall are my absolute favorite and were our first wedding gift from my best friend's mom aka my second mom. The kitchen. I'm sure you can pick out what it my least favorite part of this kitchen. Thank goodness I only have to look at those counter tops for just a few more months!!! View from the kitchen island. See how bright it is outside? That's because of the crazy amount of snow outside! They start framing our house tomorrow!!! I'll do another update post soon! 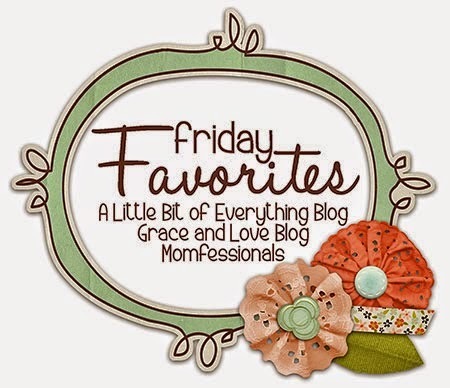 I'm linking up with Erika, Andrea, and Narci today for Friday Favorites! I'm taking 2 classes this term--one on integrating technology and one that is a foundations class. These are just pre-requisites before I can get into my actual degree. I'm getting my masters in Library Media! It's been a little overwhelming this week (as in, I had a MASSIVE project due for one class....alone) and I'm not going to lie, lots of tears have been shed. I think things will get better once I establish a new routine and get used to doing grad school. I thrive in a routine and will just need to make a new one. This is what our land looked like when we bought it. In the month since we signed our contract, we had snow, extreme cold, ice, and lots of rain. Our lot was empty for what felt like forever. I went for a run Tuesday afternoon after school and decided to run by our land to see if they had started. (We like about a mile and a quarter from our new house.) Once I made the turn into our subdivision, I noticed a cement truck but thought it might be for the house next to us because it is in the process of being bricked. Nope!!! They had started on our house! We couldn't get a great picture because of the piles of gravel and sand in front of our house. We have loved hopping in the truck after supper and driving over to check out the process. I have a feeling that I'm going to learn a lot about how a house is built! 4. Has anyone seen the movie Cinderella? I haven't heard much about it and so I'm wondering if it's close to the original story--or if they changed it. I'm planning on going to see it over spring break. I hope everyone has had a great week! I'm so ready for spring break to get here--I'm going to get my grad school work for the week done ASAP so I have the rest of the week to do whatever I want! Then once we start back to school, we'll be prepping for our state's standardized test, taking it, and then taking semester exams. We'll be out before we know it! 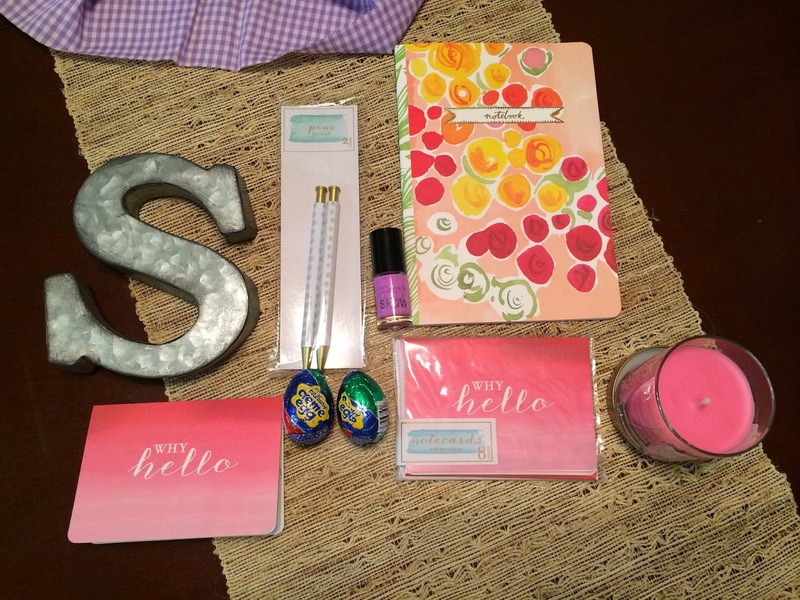 This was my first ever time participating in a blogger gift box exchange. 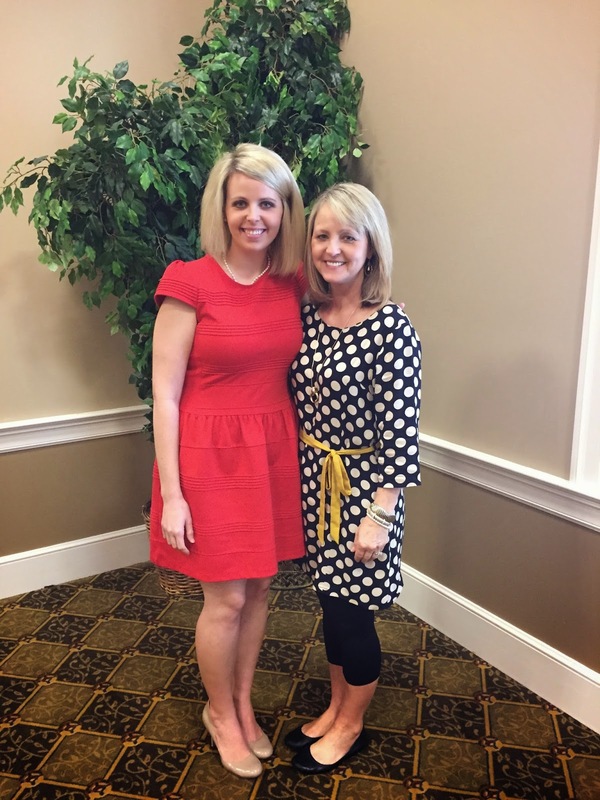 I was really excited to participate and signed up with Rachel from Floral and Fudge. The only guidelines she gave us were that our gift boxes had to be a spring theme and cost no more than $15 (and that didn't include shipping costs). We were emailed an address of another blogger and a different blogger received our address. 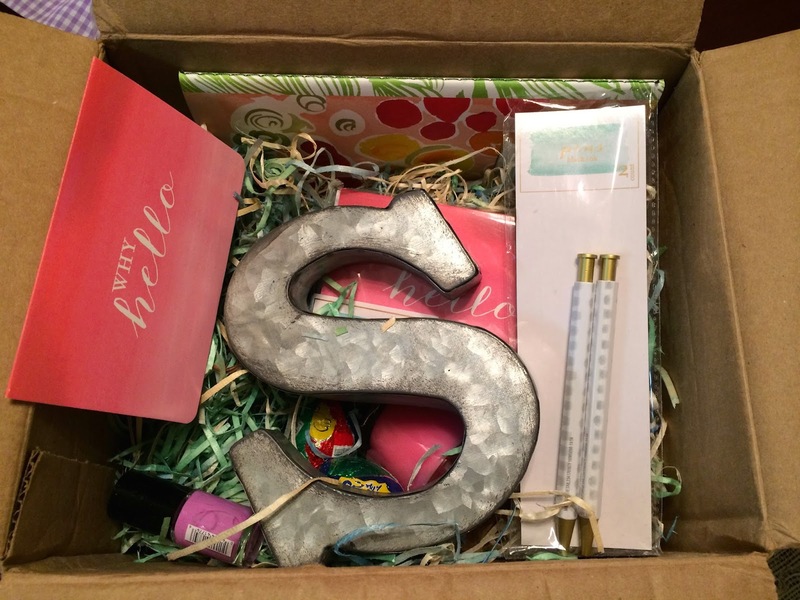 Astleigh from Hill Collection mailed me the CUTEST spring box ever! This is how my package arrived. She did WAY better than I did at packaging the box. My poor girl received hers in an envelope because the postal worker told me it would be five dollars cheaper, and I was running late to take my centerpiece to the ladies luncheon. (So sorry Keri!) Once I opened this box, I could not wait to dig in! Can I say how much I love that metal S?!?! I'm already planning on putting it on a bookshelf in the office of our new home. She put the cutest handwritten note card in my box and even gave me a set of them! I'm a sucker for notecards. I got cute pens to use to write in the notecards or the journal that she gave me. My husband said it looked like it would come from Anthropologie--which I love :) The candle was lit the day I received the box, and now stays in our guest bath! I really enjoyed participating in this gift exchange and can't wait to do another! It's so nice to receive mail these days (that isn't a bill ha!) and getting a package full of goodies is like icing on the cake!! 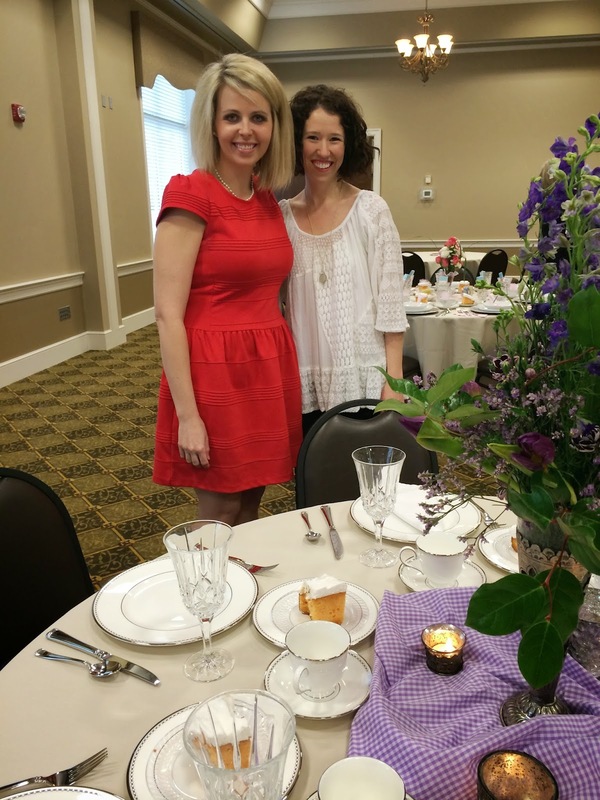 This past Saturday, my church held a ladies luncheon fundraiser for the youth mission trip this summer. Different ladies volunteered to host tables (which meant decorating them) and finding people to buy tickets from us to sit at our table. My friend Sarah and I had talked briefly about our table and had searched Pinterest to come up with decoration ideas. We knew we would use her fine china and that we wanted to go with pastel decorations. Friday night we went to church to set up after everyone else had set up. 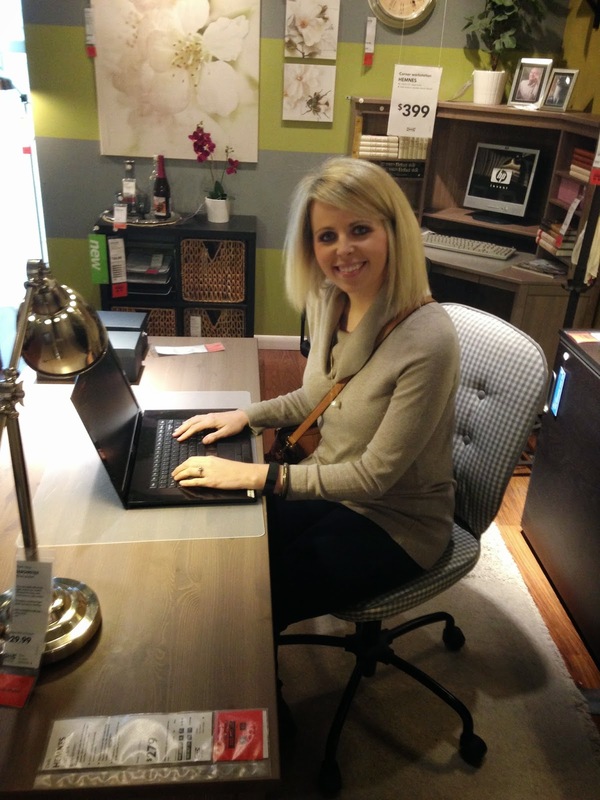 Cut to the shock on our faces when we walked in and quickly learned that our table would be the simplest one there! I think every other table there could have been at a wedding reception because they were very decorated! I should have gone around and taken pictures of other tables, but I was running late getting our centerpiece to church. I wouldn't be myself if I wasn't running behind, right?! This is after we ate our yummy meal of ham, green beans, frozen cranberry salad, roll, and orange cake, and we're listening to the speaker talk about her time as an international missionary. Look at how gorgeous my mom is!! She helped cook some of the food we ate and even had the time to sit at our table! Thanks to my friend Victoria for this dress! Will the sun ever come back out? That's all I think about since the winter/rainy weather started almost a month ago. 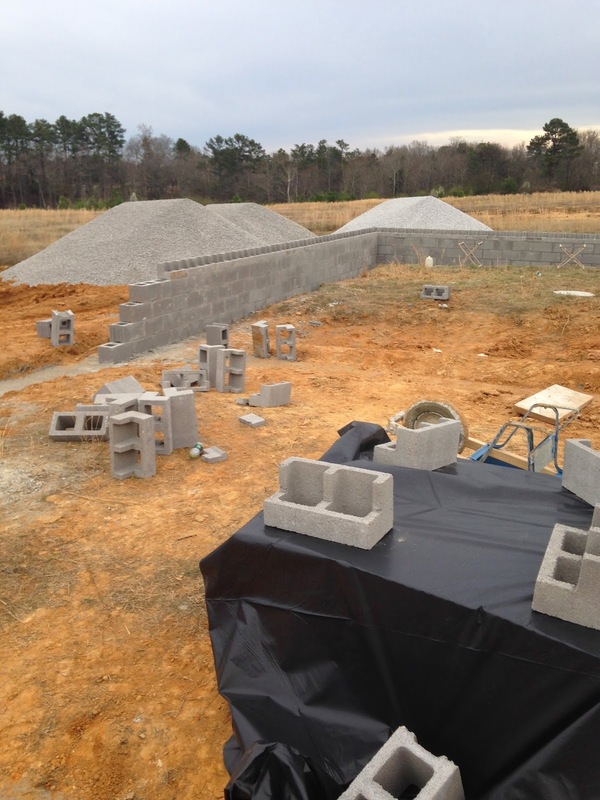 Speaking of the crazy weather, will the ground ever be dry long enough to start on our house??? I'm so ready to see our house start going up!! Here's a look at what's been going on lately! Saturday I went to Fleet Feet to get a new pair of running shoes and wanted to stop by Home Goods to look for a pair of lamps for our bedroom. Before my dad and I went into HG, we walked over to Earthfare to eat supper. Anyone else eat supper in a grocery store?? Earthfare serves the best! Anyway, I went to the juice bar to get Kale Lemonade. It was my first time trying juiced vegetables, and it was so good! I asked the worker to make me something sweet but healthy. 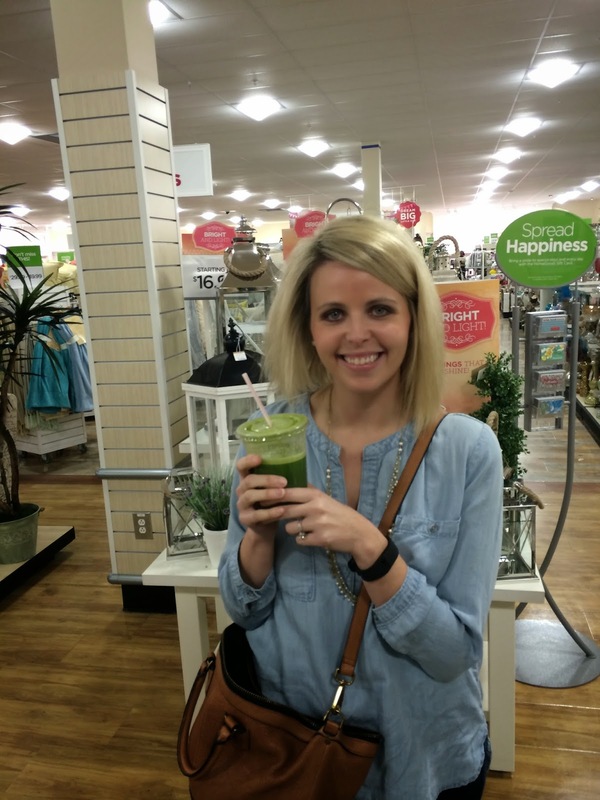 It had a bunch of kale, 3-4 granny smith apples, a chunk of ginger root, and what looked like 1/4 cup of lemon juice. So so good! 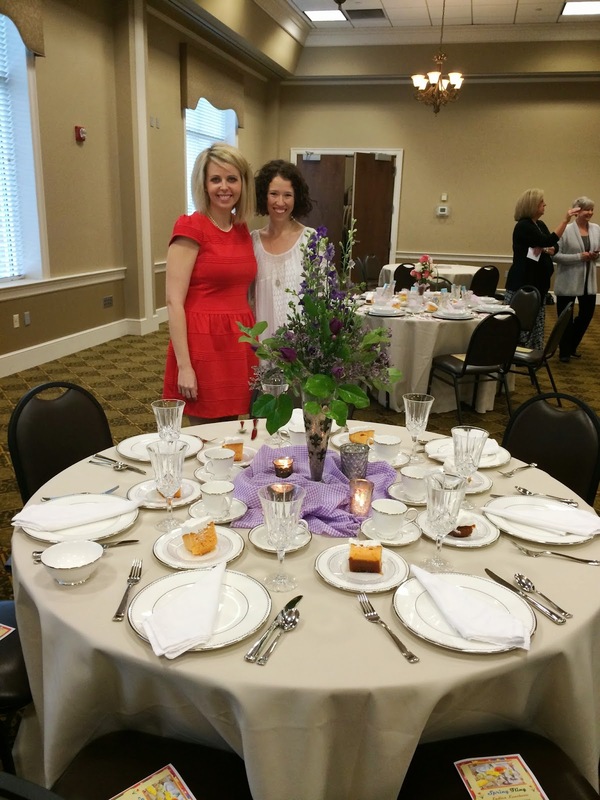 This Saturday, my friend Sarah and I are hosting a table for a ladies' luncheon at our church. This is one of the pictures of our inspiration. The main inspiration from this photo is the pastel color scheme and the center piece. There's no telling how ours will turn out :) I'll try to remember to take lots of pictures. 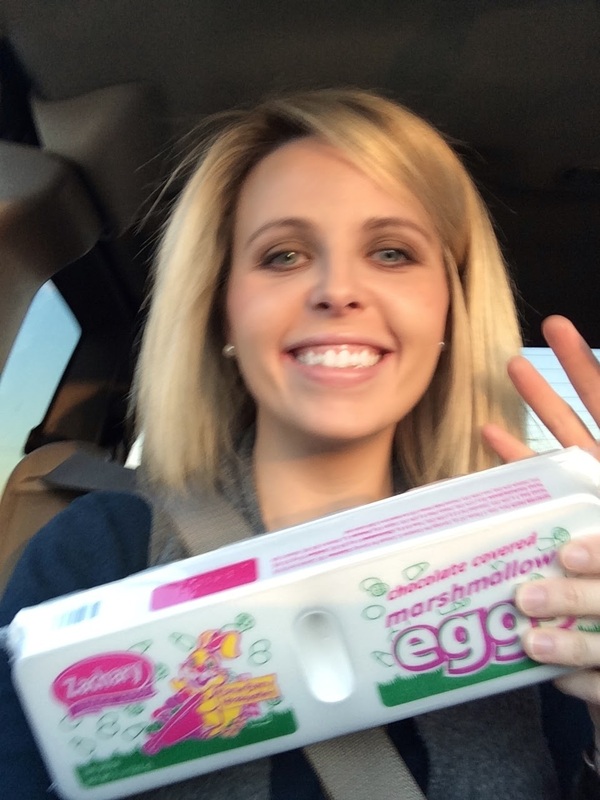 I took this picture to send to my mom to show her I bought myself her favorite Easter candy!! My mom is obsessed with these marshmallow eggs, and since I no longer live with her, I'll have to buy my own if I want any ha! Notice Dustin's fingers? He was going to wave Hi haha! We're finishing up the novel Stargirl in my class right now. It's about a new girl who's different--everyone hates her at first, then they love her, and then they go back to hating her. The whole time she's looking for acceptance and friendship. 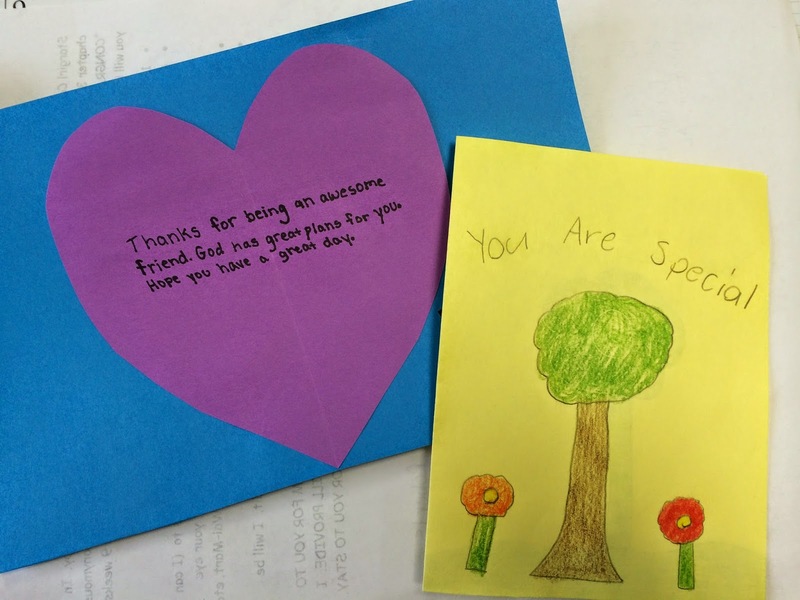 In the book, Stargirl sends out anonymous cards that are encouraging to people she knows needs it. My students had to do the same thing for their extra credit opportunity this 9 weeks. These are just two different cards from kids, and I have a lot more! I hope people are encouraged when they receive one of these in the mail! Happy Friday, y'all!! It's felt like Friday for me the past two days, but at least the sun is out today! I'm linking up with Andrea and Erika today! 1. This week, we were out of school both yesterday and today, so we only went to school 3 regular days this week. Last week we went maybe 1 or 2 regular days and were out 3? Maybe none? President's Day week we didn't go any regular days and we were out twice?? This weather is killing me!! I'm not a fan of the cold and snow and CANNOT wait for spring weather to arrive. Today I can't wait to finally leave the house once all of the ice melts. 2. Speaking of spring, Easter is in less than a month!!! Unfortunately, Dustin has to work nights on Easter weekend, so I'll only need to be shopping for myself. For some reason, I couldn't get some of the images to save to my computer, so I've put the links here. Let me know which one you think looks the prettiest! 3. THE BACHELOR FINALE!!!!!!! Monday night--I'm so excited!!!!! I wasn't a fan of Chris the first half of the season and I'm still not completely his fan, but I like him a lot better than I did. But I have no idea who he is going to choose! Becca or Whitney? Whitney wants it more, but does he want Becca more? What do y'all think? Part of my Christmas present were tickets to see Wicked in Atlanta!! Dustin surprised me Christmas morning with tickets to the 2 o'clock show in a new purse he had bought me! I was so excited and Dustin....not so much ha! Before the show--we had pretty good seats! We didn't know if we would make it in time because we got stuck in two different construction zones heading to Atlanta so our lunch plans didn't happen. Instead, we scarfed down Quiznos in 5 minutes (no joke) and ran into The Fox Theatre to find our seats. I had already seen Wicked but it was great to see it again and Dustin actually thought it was okay! 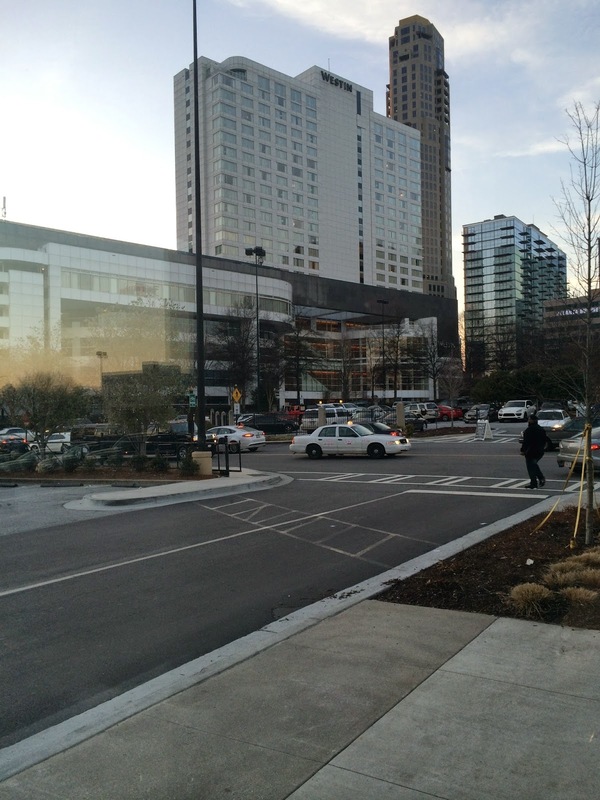 We ended up staying at the Westin Hotel in Buckhead so it was right outside the craziness of downtown. We checked in after the show was over, changed clothes, and walked to the restaurant where we ate dinner. I took this photo inside our restaurant's lobby while waiting for a table. We ate at True Food Kitchen in Buckhead. It was so good! If you eat a gluten-free diet, then you need to eat here. 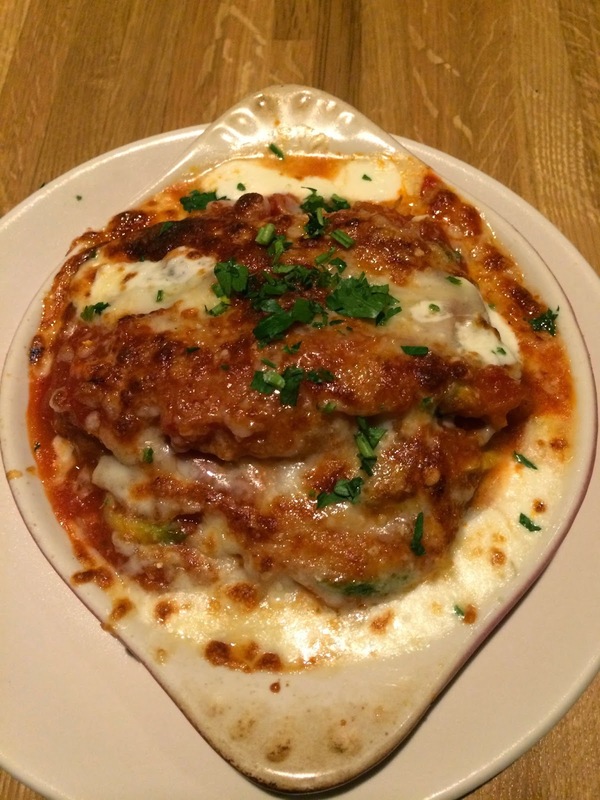 I ordered the Spaghetti Squash Casserole, and it was great! It looks really big in this picture, but that dish was pretty shallow. There was a little bit of mozzarella cheese on top, and then spaghetti squash and zucchini mixed with pasta sauce. YUM! Sunday we ate at The Varsity. I had about three bites of this and gave the rest to Dustin. 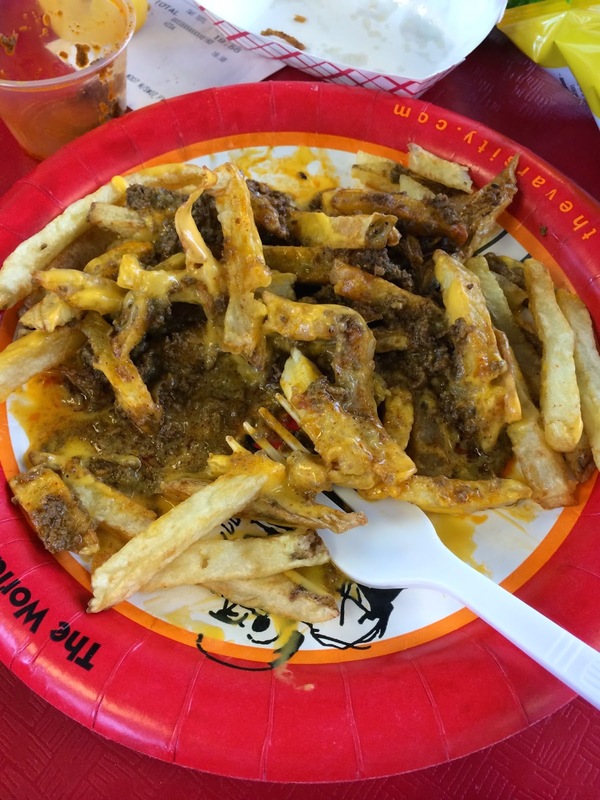 I just can't eat food like this anymore because it makes me sick. After lunch we headed to Ikea. I decided I'm over Ikea. The last time I went I had just graduated from college and was broke. The cheap furniture was awesome. Now, not so much. If I'm buying anything now, I'm buying quality. 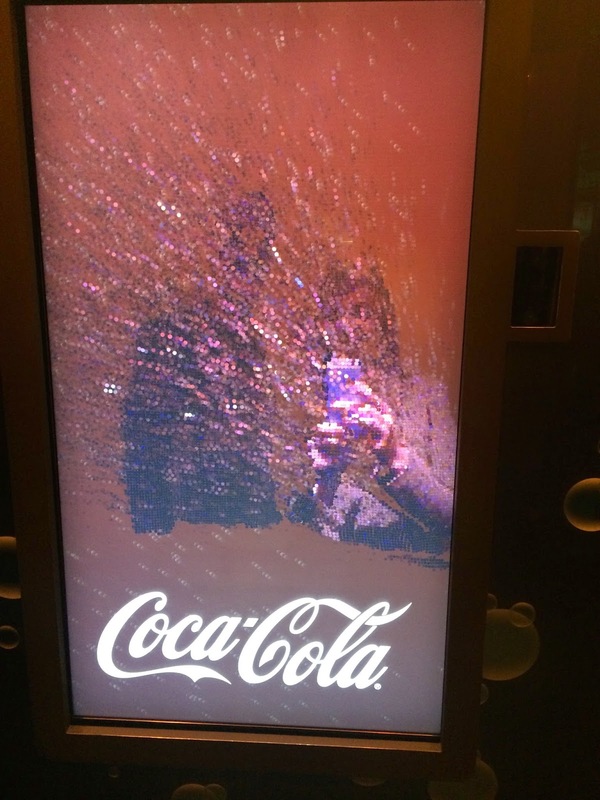 Dustin had never gone to the Coke Museum so we went there next! The best part?? The Taste Room!! Apparently, Coca-Cola now makes chocolate milk and we loved it! We drove around a lot, ate too many cupcakes from Sprinkles (our new favorite), and enjoyed planning our next trip to Atlanta!! I hear there's snow in the forecast, again, this week. Hopefully, I'll get around to doing a post about our insane amount of snow last week. Where are you warm weather?